By Shelton Brooks. Arranged by Derek Hasted. Score, Set of Parts. 22 pages. Published by Derek Hasted (H0.543270-SC000016689). 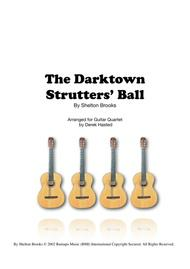 Shelton Brooks wrote this bouncy little song in a different age - where "Darktown" was an area of a city much like Chinatown is today. It tells the story of the Ball where women would wear their finest dresses and men would "strut" - a sort of swaggering dance. 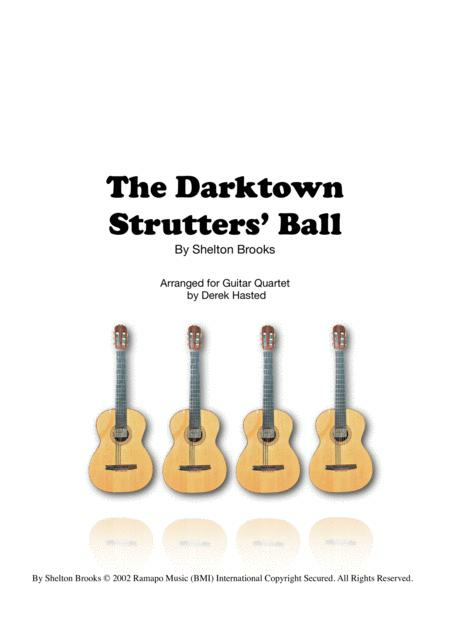 Derek Hasted writes "I first arranged this piece for the Hampshire Guitar Orchestra, in a Dixieland-jazz setting, which I have retained in this version for 4 guitars or a large ensemble. The bass part would also suit an octave (or contra) guitar reading from treble clef. This line is a little easier than the other lines, so it's ideal for a mixed ability ensemble as well as making a real contrast in a conventional guitar concert. In the final chorus, one can almost hear a tenor banjo above the bass, and a clarinet swirling above the tune. Audiences love this piece!" This is one of a growing range of accessible ensembles from experienced arranger Derek Hasted, and is supplied as full score and parts with no page turns in the part scores. Check out Derek's other arrangements - search SheetMusicPlus for Derek Hasted and you'll see the full list, all with soundclips and sample score.